Bollywood actor Vicky Kaushal responds to BCCI’s Tweet on ‘How’s the Josh?’ the dialogue which went viral after the movie was released. From Prime Minister Narendra Modi to Defence minister Nirmala Sitharaman everyone’s using it for their own agenda. On Sunday, team India too celebrated their victory in ‘Uri’ style. 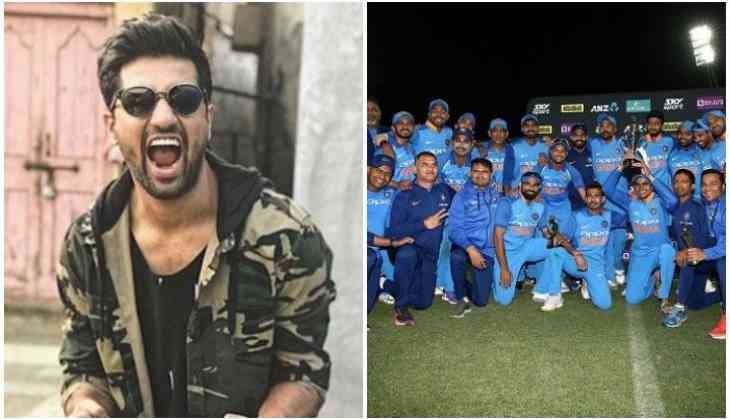 BCCI shared a video from their Twitter handle where Kedar Jadhav from one corner chanted ‘How’s the Josh?’ to which the other team members responded ‘High Sir!,’ the BCCI also tagged the lead actor of the film Vicky Kaushal. Sharing BCCI's video of India's 'How's the Josh?' celebration, Vicky Kaushal tweeted, "Our Indian cricket team always gets the JOSH of the nation super high and makes us all proud! Congratulations on the amazing win! INDIAAA INDIA!!!" As far as the match is concerned, India won it by 35 runs, with Ambati Rayudu and Yuzvendra Chahal playing an important role. Rayudu smashed an amazing 90 runs before getting out at Matt Henry’s ball, while Yuzvendra Chahal took 3 wickets from the 10 overs he bowled giving away just 41 runs. India were looking really bad at first, when they gave away 4 wickets for just 18 runs on board, Ambati Rayudu (90) and Vijay Shankar (45) forged a 98 run stand before Shankar getting run-out by Neesham and Munro. Hardik Pandya showed why he is considered a dangerous player when he smashed a match winning knock of 22 balls 45 runs. India won the five-match series by 4-1 and won a bilateral ODI series in New Zealand after 10 years. India will now play a three-match T20I series against the Kiwis starting on February 6. The first match will be played at Westpac Stadium in Wellington. Twitter CEO reveals new plan, now users will be able to edit tweets and enjoy these new features!! READ NEXT >> Twitter CEO reveals new plan, now users will be able to edit tweets and enjoy these new features! !